Thank you very much, great shop! Ironically, the BIG Shuriken CPU Cooler has an height of only 58mm and is therefore an ideal cooling solution for most HTPCs. Actually, it is BIG only in its horizontal axis. The BIG Shuriken CPU Cooler has an height of only 58mm and is therefore an ideal cooling solution for HTPCs (Home Theater Personal Computer) and computer systems with restricted dimensions. The supplied 120 mm fan is from the new Slip Stream 120 SLIM series and is only 12mm thick. The fan speed can be easily controlled by the motherboard's PWM signal which allows very flexible and quiet optimised cooling. 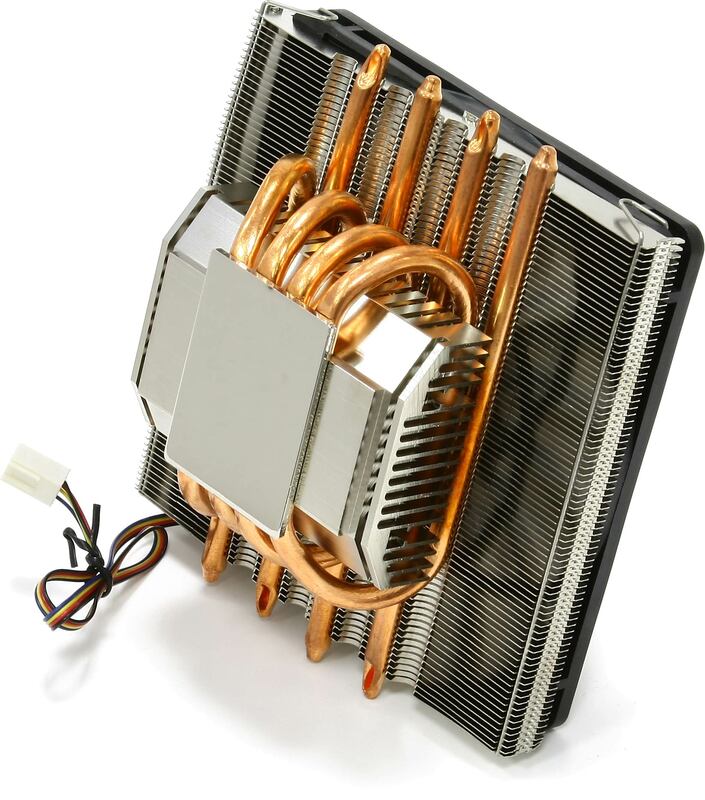 Furthermore the Shuriken BIG CPU Cooler comes with the Versatile Tool-Free Multiplatform System (VTMS) for an easy, convenient and safe heatsink mounting. 58 mm "Extreme Low Height" feature makes this product ideally compatible with the most slim HTPC Cases on the market. Newly developed and patented mounting mechanism "VTMS" allows user to install the Big Shuriken CPU Cooler without any tools or hassle. The new Slip Stream 120 mm Slim is a further development of the original Slip Stream 120mm fans. They produce high airflow at low noise level and it does this while being only 12mm thick. 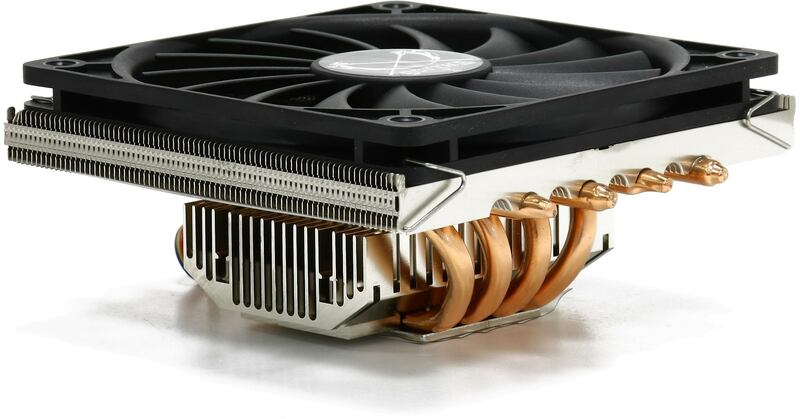 The supplied Slip Stream 120 mm Slim fan can be replaced by other after-market 120 mm fans or the Scythe Kaze Maru 140 mm case fan to optimise airflow inside the chassis and improve performance. I ordered this to cool an AMD Athlon 64 x2 4200 in an Antec Aria case on a MSI RS482M4 board. Anyone who owns one of these cases will know how tight the space is in it and this was the only solution I could find. I haven't got much to compare the cooling capability of this except the stock AMD cooler that came with the 3200 it replaced. Unfortunately, that was woefully inadequate and only a second fan sitting beside it with the case open stopped the cores reaching 70C and shutting down. This fits perfectly - almost as if it was specifically designed for the Antec Aria case. I have knocked two stars off because firstly on one side getting the clip on without removing the on-board graphics heatsink is very difficult, under load the CPU is reaching 60C, albeit with the case fully enclosed and while not a howler, it isn't particularly quiet. All that said, this is the only cooler that I could find to fit the space and keep the CPU cool so I take my hat off to Scythe!!! Fitted this on top of an AMD Phenom II 905e on an Asus M4a78t-e Motherboard. As other reviewers have said, it is a bit of a tight fit but if you put everything in, in the right order you'll be fine. Kingston Hyper-x memory (with the heat spreader thing :) just fits nicely under the fins of this thing and you'd have to remove the Scythe to get at the RAM again. I have this installed in a nice Lian Li Case and the loudest components are the hard drives (mostly the 320 GB Western Digital drive). Think my next investment may be an SSD from Quiet PC. Temps at time of writing are 35 degrees and that could probably be brought down if I applied some better thermal paste. I would recommend this to anyone but would advise you check that it'll fit. Very good in use but difficult to fit. I bought one of these to go with an AMD Athlon II x4 605e. That's the energy efficient 45nm processor. They were to replace an Athlon II x3 and Zipang cooler, the main reason being quietness. It fits very easily in my Antec 300 case, but was an absolute nightmare to fit. In the end I had to resort to using a screwdriver to lever the clips closed. The alternative was mobo removal. As it was I had to remove the top case fan to get enough access to the clip on that side of the cooler. So deduct three stars for that. On the other hand the pc is quieter - sufficiently so to satisfy me - and the CPU temperature remains in the low 30s on a light load. Give it back a star for that. The Slipstream fan is only turning at around 770 rpm and is therefore inaudible, so give back a star for that. Would I use another of these? Yes I would, but only in a new build so that I could fit it before installing mobo in case. Fantastic Heatsink, if you can make it fit! Though I knew it was BIG, I was still taken aback by the size and in my CFI A8989 Mini-ITX Cube Case its a tight squeeze but it did fit in there and with enough clearance to do the job. As the other reviewer rightly pointed out depending on your mobo configuration fixing tightly to the board can be tricky, on my mobo (J&W Minix 780-SP128MB AM2+ Mini-ITX) it wasn't difficult you just had to put things in an unnatural order than you might first think. I bought this after carefully reviewing several coolers. I didn't want one of the big heatsinks for the reason that they were heavy plus I wasn't sure if they would fit into my medium case and I wanted a PWM controlled controller plus I read that the stock fans of the highly priced Zalmans are rather loud. So I opted for this one after reading good reviews. This is the first time that I've installed a CPU cooler: It took me about 30 seconds to remove the standard (very loud) Intel heatsink, and it would have taken me 30 seconds to reinstall it. But it did take me 1 hour and 30 minutes and some blood loss to install the big shuriken!! If you look at the shape of it you notice that it is very flat and wide which means that the fixing pins are located UNDER the heatsink. There is a space of about 1.5-2cm to squeeze your fingers in AND press the pins down AND then twist them clockwise to lock them!! Remove PSU, ram, PCI EX cards etc and it is still tedious. Works very quietly though!